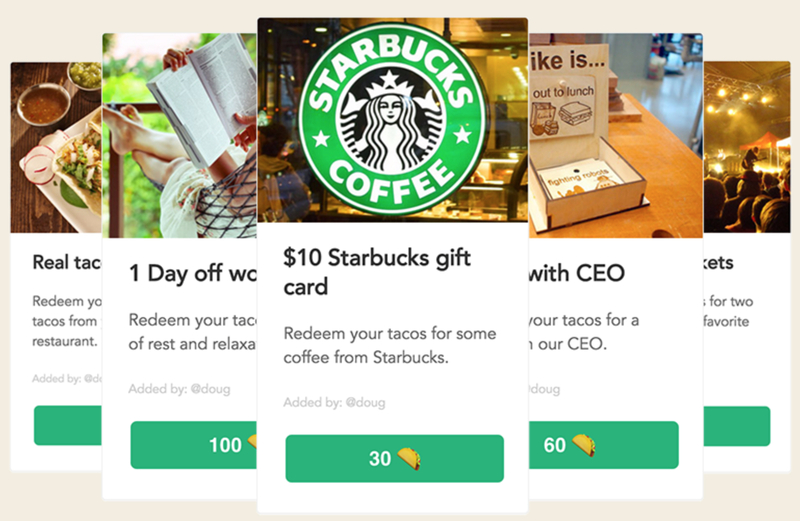 Hey Taco allows employees to reward each other for good work by simply typing a name into a Slack chat and adding a taco. Slack, the billion dollar messaging and collaboration platform, has created its own spinoff economy. 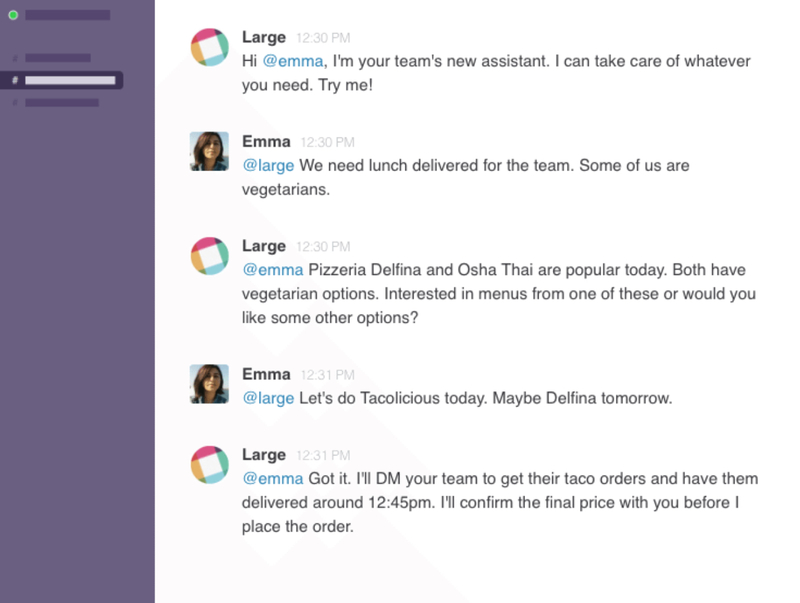 Entire businesses are being created around various Slack integrations – like Hire Large, a virtual assistant service. Simply mention @Large in Slack and someone from the Large team will help you with “whatever” you need. Hey Taco is another example of a startup leveraging the ever-growing Slack platform, and they’re building a business around the increasingly popular employee recognition and rewards model; they offer a simple tool that allows you to easily reward your team members when they do a good job. Now, you can’t wantonly distribute tacos like a crazed street vendor in Tijuana; you only have 5 tacos per day to distribute among your coworkers. Thus, your delicious tacos must be awarded carefully and only to those most deserving. 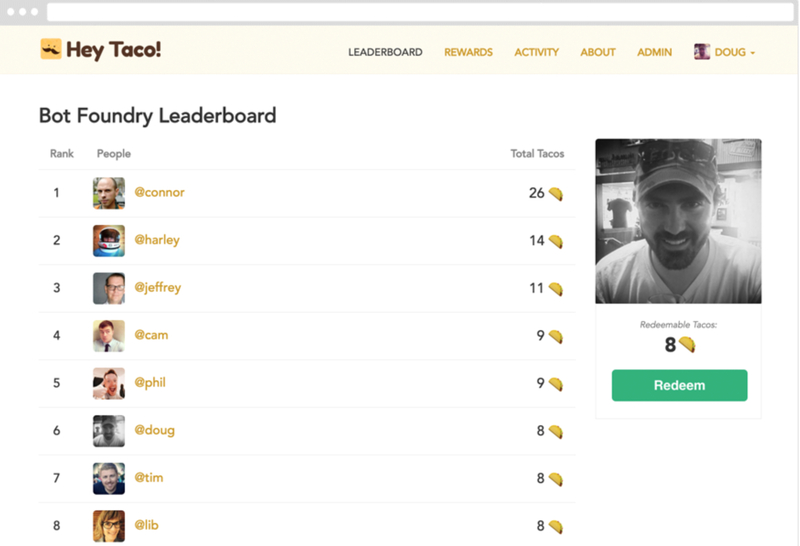 Every team has a leaderboard that shows each team member ranked by how many tacos they have been awarded by their peers. Of course, nobody is in it for the fake tacos; they can be redeemed for actual prizes based on a series of rewards that the team leader has set up in their Hey Taco account. For example, 10 tacos could be redeemed for a Starbucks gift card, 40 tacos for movie tickets, 100 tacos for a day off work, etc. One drawback should be noted though: these rewards need to be delivered manually by the team leader. The math is all done in the app (i.e., Once someone gets X tacos, they can “Redeem” a prize that requires X tacos) and there is a notification system that alerts the team leader when someone redeems. But if a team member, for example, redeems tacos for a Starbucks card, the team leader must actually take care of the reward exchange themselves. .
A free Hey Taco account allows up to 10 users and 3 different rewards. Anything above that requires an upgraded account, which starts at $39 per month for 20 team members and goes up to $229 per month for teams over 100. According to the company, Hey Taco is currently being used by companies like HubSpot, FlashStock, and TrustPilot. Especially with the rise of remote work teams and constant flattening of organizations, these types of reward systems are needed. Team leaders need ways to inspire excellence in their team members, as well as foster digital camaraderie. And there is certainly some money to be made in this market. Bonusly is an employee rewards platform that has raised $2 million in funding over two rounds since their founding in 2012. With this software, similar to Hey Taco, every month employees are given a small “allowance” which they can only use to reward the achievements of their coworkers. The rewards can then be spent in the Bonusly vendor-integrated catalog to purchase a variety of items, or even make a charity donation. Going a step beyond Hey Taco, redeeming rewards and having them delivered to the recipient is entirely automated with no human intervention required. Bonusly integrates with Slack, as well as a number of other platforms including HipChat, Google Talk, and Campfire. Achievers, arguably the leader and pioneer in this arena, was purchased last year by Blackhawk Network for $137 million. They offer a comprehensive tool with an accompanying mobile app for facilitating employee rewards, complete with detailed analytics and an extensive potential catalog from which employees can choose from. They actually have a customer service team that helps source custom rewards for individual companies. One of their favorite reward stories to tell is the time when a client employee once redeemed their recognition points for a puppy. While Hey Taco doesn’t have the power or complexity of Achievers or Bonusly, it does have a sweet simplicity to it. Recognizing teammates is as simple as adding a taco emoji. For a budding startup with only a small number of employees, Hey Taco may be the perfect solution. And hey, who doesn’t like tacos? on. Web developers play with an part in the market today. done. Backend web developers utilize coding languages to be certain all those characteristics at the site really do the work. this blog’s post to be updated daily. It includes nice material. Founder of Hey Taco! here. I just wanted to thank you for covering us. It’s pretty awesome to be mentioned in the same article with such great companies like Bonusly and Achievers. One of the things that makes us unique is that we’re not a “top-down” HR solution. Hey Taco! is a “bottom-up” platform that enables individuals to recognize each other by making it really fun and rewarding. Personally, there is something to be said about a company that allows something like this. Managing a program like this takes time, so source it out to Hey Taco and let all the cream rise to the top! I really like this idea. I feel that most workplaces try to implement something of a rewarding program, but fail. This company is a great solution for that. These are feel good things to read. Too bad, larger companies would not be putting any money into something like this to show their employees are worth the time they are putting into the company. I have always been a huge fan of any platform that allows other employees to reward each other. It is a great motivator and I just wish all of the companies I have worked for would implement one.